URL shortening is a technique in which a URL is made substantially shorter in length and still links to the required page. This is achieved by using a redirect on a domain name that is short, which links to the web page that has the longer URL. In this tutorial, I’ll show you how to create a URL shortening plugin for WordPress using Google’s URL Shortener API. On Twitter and some other messaging services there is a limit to number of characters a message can contain. So if you’re sending long URLs then it will occupy most of the message. Printed books or display signage will often use shortened URLs as they are easy to be read and type. QR codes have a character limit. Very long URLs don’t fit, therefore shortening of the URL is required. To use the Google URL Shortener API you’ll need to acquire an API Key. This API key is used by Google to keep track of your application. In the left sidebar, click and expand APIs & auth. Next, click APIs. In the list of APIs, make sure the status is ON for the Google URL Shortener API. In the sidebar on the left, select Credentials. Then generate a public access key if you haven’t already. This public access key is the API key. 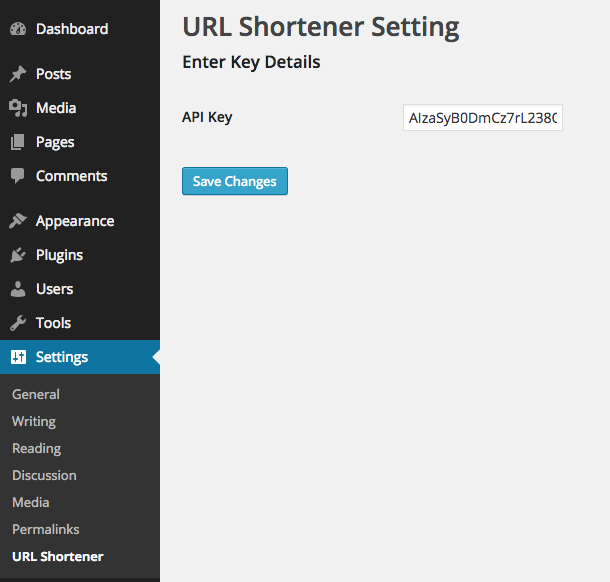 We are storing the API key as a WordPress option with the name url-shortener-input-field. To shorten a long URL you need to send a POST request to the https://www.googleapis.com/urlshortener/v1/url URL with your API key and long URL. Note: You cannot send more than 1 million requests using the same API key in a day. We want to display the shortened URL in a meta box in the post edit screen. For creating a meta box, we’ll use the Meta Box API and for the URL shortening we’ll use the WordPress HTTP API. We created a meta box using the add_meta_box function. We’re retrieving the long URL of the post using the get_permalink() function. Then, we’re checking if we already have a short URL of this long URL in the database as a WordPress option. If not, then we’re retrieving it using the HTTP API and storing it as a WordPress option. Otherwise we use the existing short URL. This plugin plays nicely with the Google URL shortener web service as it doesn’t request a new URL every time, instead it stores it once it’s retrieved. We are first checking to make sure WordPress is processing a post. If it’s a page or custom post type, then we aren’t displaying the short URL. However, if you want to display it in every page then remove the first two lines from the function code. Then we’re doing everything the same as we did while displaying the short URL in the meta box. The only difference is that instead of echoing it, we are concatenating it to the post content. 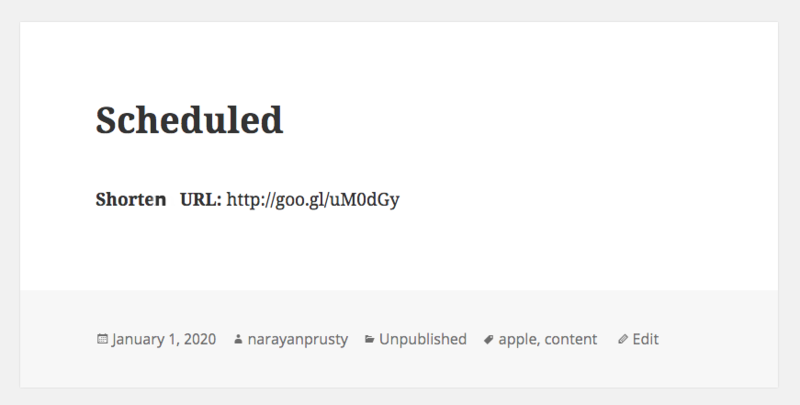 Now we’re done with building a awesome URL shortener plugin for WordPress! If you’d like to check out existing plugins, two of the most popular URL Shortener plugins in the WordPress.org Plugin Directory are URL Shortener and WP URL Shorten. WP URL Shorten uses ref.li to shorten URLs. Ref.li provides real time stats and other traffic information of people visiting your site via their shortened URL. URL Shortener plugin lets you choose between Bit.ly, Su.pr, YOURLS, Goo.gl and many other services. This plugin can also generate QR Codes. In this tutorial, I’ve shown you how to easily build your own URL shortening plugin. You can now go ahead and expand on this to add more features such as QR code support and use other URL shortening services. Please share your experience with your own plugins below.